As the People’s Bank of China slashes interest rates, the potential for a Chinese slowdown is back on everyone’s mind again. China’s growth has slowed from above 12% to just 7.5% now. That’s the government’s target, and a lot of economists don’t even believe that’s manageable. That matters for pretty much everyone else in the world too: by at least one measure China is already the world’s largest economy, and if the mammoth exporter sneezes, the rest of the world could easily catch a cold. A dependency ratio is simple: it’s just the number of people aged between 0-14, combined with those aged over 65, in relation to the working-age population (16-64). Those figures are from the United Nations population division. 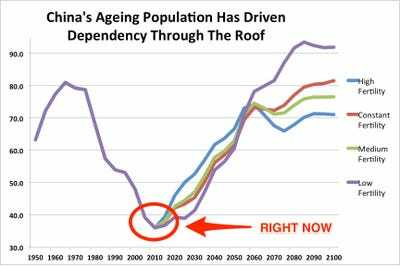 So if your dependency ratio (the left hand side of that chart) is 90, it means there are 90 people over 65 and under 14 for every 100 people of roughly working age. And China’s is going to spike, under just about any circumstance, because of the country’s disastrous one-child policy. 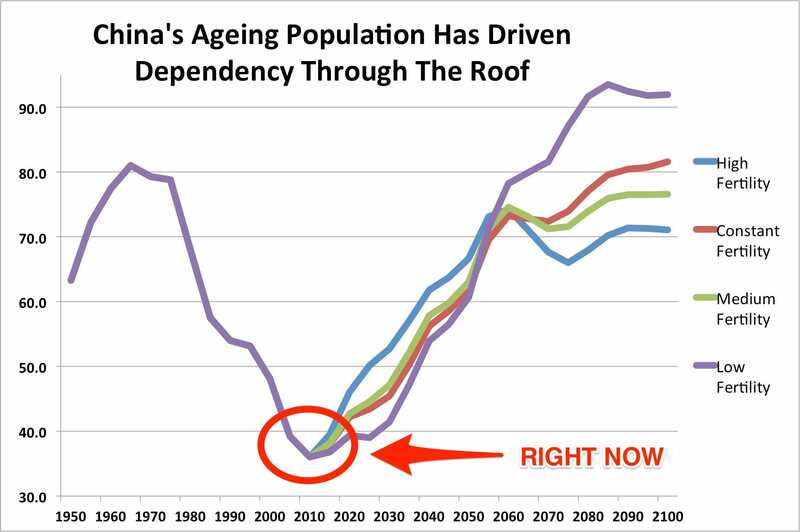 In the second half of the 20th century, the population was ludicrously child-heavy (which is why the dependency ratio looks high in the 1960s), so there were a lot of young workers and not many dependents during China’s rapid growth spurt. With fewer people working, and more pensions and medical care to pay for, even if China performs brilliantly in every other way, a growth slowdown is completely unavoidable.